RTG is one of the most respected software providers that develop slot games and desktop and mobile players will have the ability to enjoy the thrills of Builder Beaver. This themed slot is packed with animations and action and there are some impressive wins that can be collected, including a 10,000 coin jackpot. With a high payout rate of over 96%, real money players can expect decent returns as they enjoy the adventures of Builder Beaver. Offering wilds, scatters, free spins and more, this game is one of the great choices from RTG and it will fit nicely into low roller casino budgets. 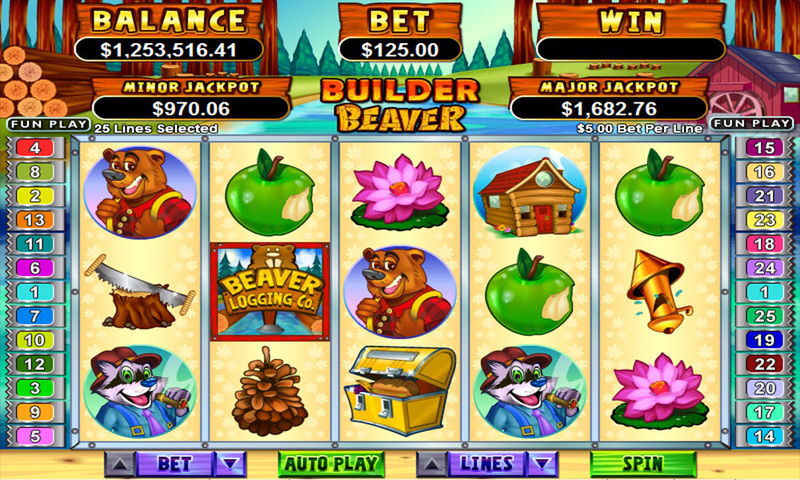 Builder Beaver is also a random progressive jackpot slot, so players can win at any time. Real Time Gaming creates some great video slot games and with Builder Beaver, there are five standard reels that contain 25 paylines. Players do not have to bet on all paylines, but the more that are covered, the better chances one will have to generate payouts. The game has a cartoon appearance and makes use of bright and colourful symbols. Oplauers will see apples, flowers, beavers, treasure chests and more on the reels and the game is complimented with great sound effects every time a winning combination is created. HOW TO PLAY Builder Beaver? With this great game from RTG, players can preview the title for free or they can choose to immediately start placing wagers. The game is easy to control and players will use the Line button to select from 1 to 25 paylines. They will then use Bet to increase or decrease the total bet amount, which can range from €40.01 per payline to a maximum bet of €6.25 per spin. With Builder Beaver, players can choose to use Autoplay, where they can select a bet amount and then choose to automatically play as many as 1000 spins. RTG slot games are known to have many added features and with Builder Beaver, there are some great game additions that can increase overall payouts. Wild and Scatter – The Builder Beaver is the wild in the game and will take the place of every symbol except for the scatter. The Wild is the jackpot symbol and will offer the 10,000 coin payout when five appear on a payline. The Beaver Logging sign is the game scatter, offering payouts for two or more. Free Games Features – There are two free game bonuses with Builder Beaver. The first is the Sign Feature, triggered with three or more scatters. This offers 1-0 free spins and double payouts. This feature can be retriggered. The other feature is the Beaver Feature and this offers 12 free spins with triple winnings. Random Jackpot – At any time after a real money spin on the game, players will have the chance to win a random progressive payout. Builder Beaver is a fantastic game that can be enjoyed for low bet amounts. This game has an impressive RTP of over 96% and is a medium volatility game that can offer large payouts when winning combinations are formed. With two bonus features and the chance to win a random jackpot. The game has become a preferred option for many. Players, we need your help with how we should to rank and rate these reviewed casino games. You can help us by rating this game, and if you really enjoyed playing Builder Beaver. You can also share it with your friends on Facebook, Twitter and via email. For all freeplay games, if your free credits run out, simply just refresh the page and your balance will be restored.